Solo Female Traveler: Who's hungry? Another big thank you to Patti Davidson for this one! 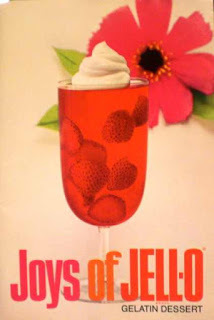 The Joys of Jello exerted a perverse fascination for me in childhood, and I was thrilled beyond belief when she gave me a copy of it last night. 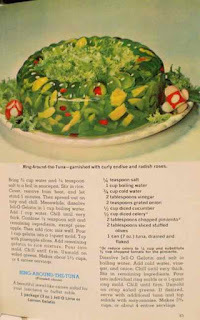 So much so, in fact, that I couldn't wait to take a few photos of its marvelous illustrations so that everyone can share in the magic of its oversaturated colors and surprising combinations of foodstuffs. 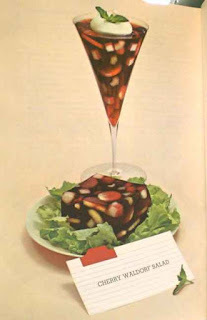 Imagine the triumph of serving such a clever dish as the "Sea Dream" at a ladies' luncheon, circa 1968. 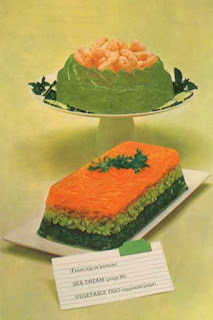 Your friends would be so impressed!